Ryan Jeffress, a founding member of the Tidewater Piranhas Power Soccer Club, died in his sleep at his home in Nacogdoches, Texas on the morning of 27 Nov 2013 of complications from Duchenne Muscular Dystrophy. He is survived by his parents, Theresa Jeffress of Nacogdoches, Texas, and father Michael and his wife Priscilla Jeffress of Thibodaux, La. ; two sisters, Britnie Jeffress of Lufkin, Texas, and Meleah Jeffress of Nacogdoches, Texas; grandparents, William and Gwen Wright of Heber Springs, Ark., and William and Brenda Jeffress of Bonanza, Ark. ; a nephew, a niece, and a host of aunts, uncles, cousins and friends. Ryan was born on 23 April 1993 in Searcy, Arkansas and grew up there until moving to Virginia a few years later. In 2005, he participated in an introductory clinic about power soccer in Williamsburg, Virginia, given by Jerry Frick. He immediately fell in love with the sport and along with 4 others from the Tidewater area of Virginia, formed the Piranhas Power Soccer Club. He wore #22 for the team and, in 2007, helped the team win second place in their first National Division 2 Championships. Ryan served as a goodwill ambassador for the Muscular Dystrophy Association in Texas and Virginia and helped raise thousands of dollars to fund research and send kids to MDA Summer Camp, which he dearly loved. In 2003 he and his family were featured on the National Jerry Lewis MDA Telethon show. In 2009, Ryan and his family moved back to Texas where he helped form the Nicholls State University Beta Sigma Iota (BSI) Blazin’ Cajuns power soccer team in Thibodaux, LA. In 2011 he graduated from Nacogdoches High School as a National Honors Society member and enrolled at Stephen F. Austin State University to study broadcast journalism – he was a living encyclopedia of sports trivia. Ryan's faith was also important to him and he was an active leader in his youth groups at church. 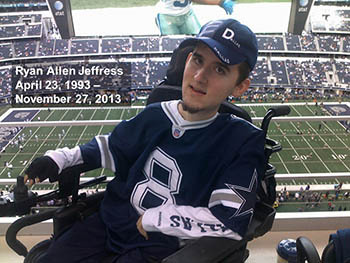 Additionally, he was an avid Dallas Cowboys fan and his father recalled, “Ryan loved sports. He served as the team manager for various ball teams at his schools. When he appeared on stage with a local radio DJ host to introduce the Newsboys at a fundraising concert in 2003, the DJ asked him, ‘If we raise a lot of money that funds the research to find the cure and you can walk again, what do you want to do when you grow up?’ Without hesitation, Ryan said, ‘To play quarterback for the Dallas Cowboys!’"
We will miss #22 and his wonderful friendship, sportsmanship, and camaraderie.